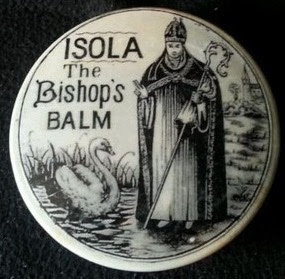 A superb pictorial showing a bishop next to a swan, whcih reprsents Bishop St. Hugh (Bishop of Lincoln 1186-1200) who was famed for befriending a wild swan. The exact origin is unknown however scveral of these pots have been discovered in the Lincolnshire area. 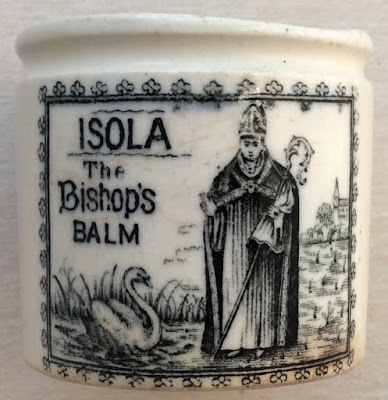 It is believed that a John Larman Nicholls was the manufacturer of the ointment known as the Bishop's Balm as the Times newspaper reported the bankrupty of this gentleman in 1900. 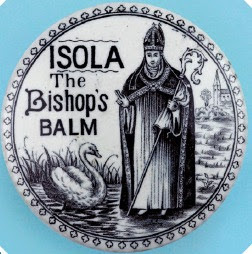 There is also a pot lid with this famous pictorial and according to an advertisement for the product, the ointment was sold for 1/1½ and 2/9. 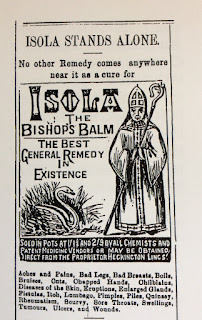 The lower price probably for the ointment and the higher price for the lidded pot. The pots and lids and quite sought after but BEWARE - there are some fake lids in circulation. Herewith two images of fake or reproduction lids. Note the correct lid has a pattern around the border. which attracted some high bids which were subsequently retracted as doubts of the lids authenticity became apparent. book produced by Messrs. Houghton & Priestley, page 93.